» When You Refactor, Are You Using Small Steps? Refactoring remains a much-misunderstood discipline. Even when folks do have unit tests to back their changes, how long does the code stay broken? 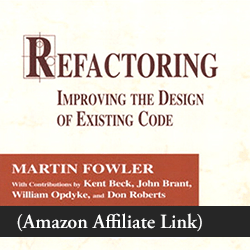 Let’s return to the idea that refactoring happens in very small steps. No, even smaller than that. Remember this code from the code smells exercise? I made the names generic because I anonymized a section of real code. The View Controller should just ask the View Model for the placeholder text, rather than having a conditional statement. That conditional belongs in the View Model. This will be our goal. How do we get there? It’s tempting to start ripping things apart, tossing all the pieces in the air. But the problem with making changes here & there is that we’ve broken the code—and we don’t know how long it will remain broken. That’s not the Refactoring way. Disclosure: The book links below are affiliate links. If you buy anything, I earn a commission, at no extra cost to you. So take a few moments right now to think about it. How would you shift things to the View Model? Now, can you take that step, and break it down even further? A field is, or will be, used by another class more than the class on which it is defined. What we want to do is pass the strings to the View Model, instead of passing them to the view controller. The smallest change I can envision is to add the strings to the view model. We won’t even remove them from the view controller yet. But adding a field will break every test that starts with these lines. That’s painful. Let’s reduce the amount of change needed. The pain we’re feeling comes from duplicate code. Instead of setting up the System Under Test repeatedly, let’s extract that creation to a Test Helper. Even to make this Test Helper, I want to do that in small steps. And I want to lean on automated refactoring support as much as possible. Ready? Here we go! 1) We can’t just Extract Method because some tests need to specify isAlternateStyle with false, and some with true. The method we extract needs to take that as a parameter. So the first step is to perform Extract Variable on literal value. 5) Now for every test that sets up the view controller with isAlternateStyle: false, I can use this new line. I do “Replace all” in file. 6) Now I edit the replacement strings, changing false to true so it will transform the isAlternateStyle: true cases. I do “Replace all” in file. This completes the Move Field refactoring! The strings have a new home. This will let us move responsibility for the placeholder text from the view controller to the view model—as more refactoring, of course. Don’t just make a bunch of changes and hope for the best. You can do real refactoring instead. Refactoring is moving in small steps, with each step verified by unit tests. Refactoring is moving in small steps, with each step verified by unit tests. A single refactoring like Move Field is composed of smaller steps, often using other refactorings. Each small step is really quick, and includes a test run. So it’s important to have quick turnaround time for building and running tests. Add the new thing. Shift each use from the old thing to the new thing. Then remove the old thing. …This is a common pattern in refactoring. The only times we couldn’t commit our changes to master were when things were broken. And we minimized those times. If you’d like to see a demonstration of refactoring, watch Refactoring Demo: Is It More than Just Changing Stuff? It’s 12 minutes long, and may help give you a visual “feel” for what refactoring looks like. Do you have any questions about this refactoring? Can you break down your next change into smaller steps, verifying each change? Please share in the comments below. Previous Post Why Is Random Order a Big Deal for Test Quality? Next Post Refactoring: How Do You Clean a Mess? Good post. It’s very important to remember to always move in tiny steps when refactoring. Sure it’s tempting to re-structure the whole file at once, but that’s just as good as rewriting it (and that’s usually not good). The number of small steps may feel daunting when written out like this when in reality it happens very quickly. It’s something I still need to practice more to get the most out of refactoring and its increased reliability. Thanks, Aleksi. I’m frequently tempted to take larger steps, “to save time.” But at some point, I’m usually bit by doing so, which reminds me to take it smaller.